My Camellias may have their own special section, but this doesn't mean I can talk with authority about these beautiful shrubs. Most are unwanted plants rescued from other people's gardens. So please forgive my somewhat embarrassing lack of Camellia knowledge. 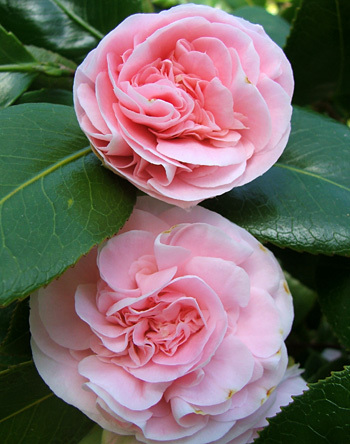 Two Camellias were planted in the garden when I first arrived - one bright pink, the other baby pink. I started my Camellia Sanctuary, and others soon arrived, some rescued from the nursery's bargain bin. A batch of deep pinks and creamy whites were given as payment for music lessons. One beautiful red is planted in a pot to honour of Sifter the cat and the talented artist who painted his portrait. My Camellias may not have names, but they have connections! I hope you enjoy them. Nearly all the Camellias in my garden are nameless - either their labels are well and truly lost, or they've been rescued, unwanted, from other people's gardens. Identifying a Camellia from a photograph isn't always the answer, either. I knew that the big Camellia with smallish pink flowers on the edge of the Pond Paddock was 'Gay Baby'. I planted it some years ago, intrigued by the name. A few years ago I nervously googled it to check the other images. Yes. It's Gay Baby, alright! I am a compulsive plant rescuer. So I feel I must rescue the reputation of one of my most subtle coloured camellias, the misleadingly named 'Jury's Yellow'. This Camellia is a rich beige colour, and it's beautiful. In a mad hunt for rose labels I've found one for a Camellia called Nonie Haydon. Look for one thing, find another... I'm sure she's the new fluffy pink growing on the edge of the Driveway Garden border. Please, please, please... Why don't I properly record the names of my new Camellia purchases? The most beautiful Camellia in the whole gardening world is flowering at the moment - and it's nameless. More than twenty years ago I found an old label by a Camellia already planted in my garden. 'Mansize', it said, the oddest of names for the smallish, dainty, pure white flowers that this glossy green shrub produced. Spring in the year 2004 saw the Camellias by my glass-house having their best flowering season ever. They'd taken some time to accept being uprooted and shifted into the Wattle Woods, their new forever home. As promised I am taking much more notice (and many more photographs) of my Camellias, now that I am semi-retired. This is a large bush which grows in dappled shade near the glass-house. This bright warm pink camellia (name unknown) can be seen from the house in mid-spring. It is planted alongside the car lay-by. This is the most beautiful white camellia I have ever had the pleasure to meet. It's one of my spring sign-posts - I look forward so much to discovering it starting to flower.